I generally have a “no paint” policy when it comes to wood. I love the look of painted furniture, but I’ve never had a piece come out really, really amazing. But now I’m faced with a dilemma. I found this fabulous dining table at a secondhand shop for about $150. The top is pretty trashed, but that was part of its charm. Then yesterday, after a year and a half of searching, I found chairs for about $10 apiece. The upholstery needs to be redone, I’m thinking something in cream and pink, but all that dark wood is messing up the girly vibe in my pink room. I’m armed and ready to paint with $150 worth of supplies, which amounts to 2.5 litres of white paint and .75 litre of laquer. Can you believe those prices? The paint costs almost as much as the furniture, sheesh! 1) Replace the upholstery only. 2) Paint the chairs white and replace the upholstery, leave the table as it is. 3) Replace the upholstery and paint the whole shebang. I’m terrible at picturing how a thing will look – but if you re-do the chair seats first, then maybe you could see clearly what to do next. Have you thought of sanding it all and then bleaching the wood. It won’t be white, but will be lighter. I’ve never done this but have only heard about it. You could try in an unseen spot under the table … just a thought. I like the way the room is coming together for you. I like them as is! Definitely change the cushion fabric, but I tire of light wood in Denmark. Well, the dark living room furniture is beautiful with the walls, while the door/trim paint, window panels, and rug lighten things up. So I would follow suit – keep table and chairs dark, change the cushion fabric, and “finish” the rest of the room. Now I kinda like Heidi’s suggestion. That table has very interesting details on the legs! I like the dark wood table and chairs as is, but it is you home – and you should decorate as you see fit. As you say, maybe the chairs are too heavy for the look that you envision. In that case, don’t waste your time re-finishing the chairs. I hope that Opie gets to keep his royal sofa! I think that the chairs could be really charming in white, Sage. 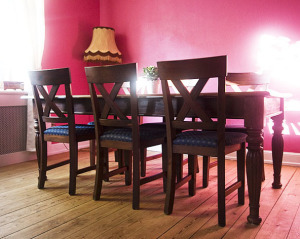 Perhaps painting the legs and apron of the table white would brighten it all up and make it look more like a set. I think I would just change the seat covers to maybe something that incorporates a pink stripe or shades of pink and not paint the whole table and chairs white. I like the dark brown better. Maybe get a piece of glass cut for the top and let the past history shine through! I just read this and I know that I’m way too late wiyh a suggestion for what to do with your furniture paint-wise, BUT I thought you’d like to know that making your own paint isn’t that hard! I’ve done it and it turns out great! After all, that’s what they all used to do back in the days..so, here’s a link for you! I hope you’ll like it!